Tracking Android phones and tablets | GET 3 Days Free Trial! We are expanding our product line by adding the ability to access your logs from anywhere in the world. Meet Hoverwatch, Refog’s new monitoring service! Being able to access the logs collected from all PCs monitored with Refog software from a single centralized location provides nearly endless possibilities. No matter where in the world you are, and no matter where in the world your monitored computers are, you’ll be able to review their logged activities by logging into your personal account. Learn who your kids talk to and chat with by tracking their Android phone! Hoverwatch is an invisible phone’s tracking app. Running silently in background, it records calls and text messages, takes note of running applications and you can track cell phone location online without your kids ever noticing. Learn about your kids’ activities from anywhere in the world! Hoverwatch sends data to a central server, allowing you to see exactly what your kids are up to by simply logging in to your account. Hoverwatch is your perfect companion for watching your kids and safeguarding their mobile devices from loss or theft. Hoverwatch helps protect your kids by watching their every step. Not only does Hoverwatch records their every call and stores every text message sent or received; in addition to that, it stores time and place they called or texted, letting you see where your kids were during the day, who they talked or chatted with, and what else they were doing there. The location is determined by using the phone’s GPS receiver. But even if no GPS is available in your device, Hoverwatch will still find the location of the phone by using data sent by the nearby cellular towers. Hoverwatch can even take a snapshot of a person unlocking the phone, letting you see who used (or at least, who unlocked) your kids’ phones at any point. Hoverwatch stores information about phone calls made or received, complete with Caller ID information, time and place of each call. But there’s more to Hoverwatch than simple call logging! You can make Hoverwatch to record the actual voice conversations, allowing you to listen to what’s been said between your kids and strangers. Same goes for SMS and MMS messages. Not only does Hoverwatch logs the messages, but itstores their actual content along with any pictures or other attachments. There are many apps offering real-time access to your phone’s geolocation information. Other apps can build and visualize routes your phone went through during the day. Hoverwatch integrates both approaches, letting you see right away where your kids are at this very moment – and allowing you to see where they have been an hour, a day or a month ago. Hoverwatch is much more than just a phone tracking app. The tool intercepts and records a lot of data such as phone calls, text messages and applications, allowing you to see what your kids are up to or find out who they chatted with in that Starbucks last week. Hoverwatch protects your kids and their phones at the same time. Should the phone grow legs, you can always login to your Hoverwatch account and see where your phone is on the map, tracing its route from the moment it was stolen. Better yet, Hoverwatch can take snapshots of whoever unlocks the phone, helping you find out who has your device after it’s been lost. Hoverwatch checks back periodically in background regardless of whether the phone is locked or not, helping you track down your lost device even if it’s never touched. Many free Android tracking apps only support free OpenStreetMap. Hoverwatch supports both OpenStreetMap and Google Maps in Street and Satellite view, allowing you to choose maps with better coverage for your area. Hoverwatch is designed for families and parents concerned about their kids’ safety. The ability to run invisibly in background helps parents look after their kids without them even knowing. 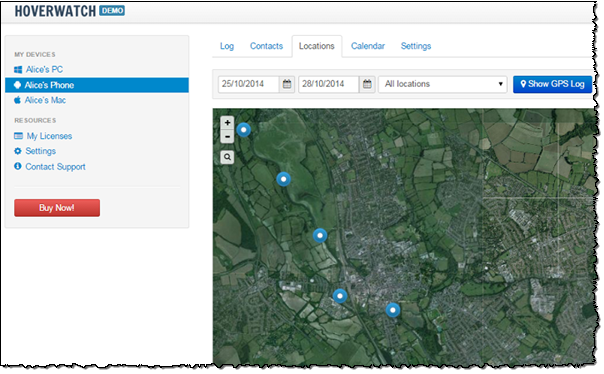 Continuous monitoring and periodic reporting to a central server helps find your phone on the map in real-time. The server stores data for previous periods, allowing you to build routes on the map for today, yesterday, or a day several weeks ago. The tracking ability helps you find your phone on the map in case it gets lost or stolen, while the ability to snap photos of anyone unlocking the device helps identify the new “owner”. *GPS location Your phone’s GPS coordinates are continuously collected and periodically transmitted to the server. The data is used to discover the location of your device and to map phone activities during the past period. *Incoming and outgoing calls Hoverwatch collects information about made and received phone calls. Information about the other party is collected based on Caller ID and address book data. The data is transmitted and stored on the server. Hoverwatch can intercept and record voice from phone calls, allowing users to listen to their kids’ conversations. *SMS/MMS messages Text and multimedia messages are captured along with time and geolocation information. The full content and accompanying meta data are recorded, transmitted and stored on the server. *Unlock snapshots Hoverwatch can make photos of persons unlocking your phone. These images can be used to discover who used the phone at any point. Hoverwatch is a subscription-based service, but your first 3 days are always free. Get a no-obligation trial to discover the many benefits brought to you by Hoverwatch!